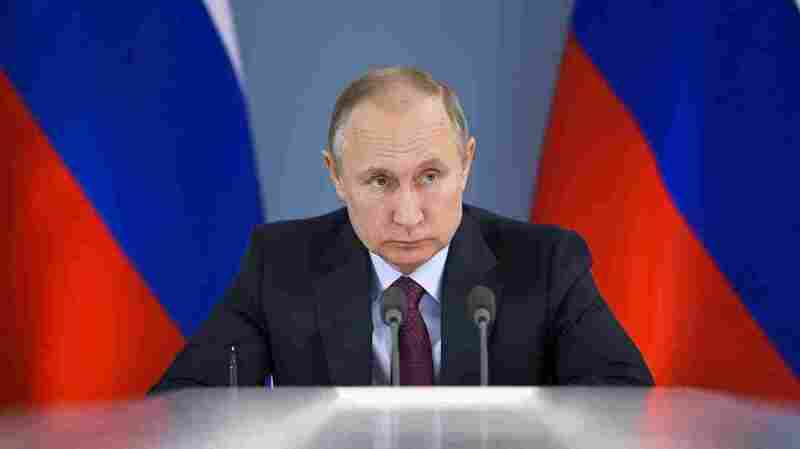 U.S. Imposes New Sanctions On Russia Over Election Interference, Cyberattacks The economic restrictions target people named in an indictment brought by Justice Department special counsel Robert Mueller. Vladimir Putin's Russian government has been repeatedly accused of interfering in the 2016 elections. The sanctions mark the most significant move against Russia since President Trump took office more than a year ago. They arrived as Washington's closest ally, Britain, is locked in a diplomatic struggle with Moscow after accusing the Kremlin of using a nerve agent to poison a former Russian intelligence officer living in the United Kingdom. Among the Russians sanctioned by the U.S. on Thursday are 13 people and three entities, including the Internet Research Agency, indicted by Justice Department special counsel Robert Mueller for their alleged role in Moscow's influence operation during the 2016 campaign. Trump has repeatedly questioned whether Russia did indeed interfere in the election, despite the assessment of U.S. intelligence agencies that the Kremlin carried out a sweeping influence operation and propaganda campaign. Lately, however, he has changed his tune and accepted that the active measures took place. Last week, he vowed to "counteract very strongly" any interference in this year's midterm races. Two Russian intelligence agencies — the domestic-focused Federal Security Service, or FSB, and Russia's chief military intelligence organization, the GRU — also were hit with sanctions along with six senior GRU officials. Several of those individuals already faced U.S. sanctions. Sanctions against the government agencies are mostly symbolic and are not expected to seriously constrain the campaign of active measures against the West. "The administration is confronting and countering malign Russian cyberactivity, including their attempted interference in U.S. elections, destructive cyberattacks, and intrusions targeting critical infrastructure," Mnuchin said. "These targeted sanctions are part of a broader effort to address the ongoing nefarious attacks emanating from Russia." Among the cyberattacks for which U.S. is trying to punish Russia was the "NotPetya" attack, which targeted computers in Ukraine. The U.S. attributes that attack to the Russian military. Mnuchin said the administration plans to impose more sanctions in an effort "to hold Russian government officials and oligarchs accountable for their destabilizing activities by severing their access to the U.S. financial system." "It took 14 months, multiple indictments, and a poisoning in Britain — but the administration is finally imposing the sanctions overwhelmingly approved by Congress," said Sen. Amy Klobuchar, D-Minn.
"However, sanctions alone are insufficient. Now we must protect our democracy going forward by securing our election systems and increasing transparency and disclosure requirements for online political advertisements." Administration officials say they're doing that. The Department of Homeland Security and FBI are working with state-level elections officials to familiarize them with the cyberthreats from abroad. "The cyber actors are using a multistage attack campaign with staging and intended targets involved," one official said. "And the campaign is long term and still ongoing." "After obtaining access, these actors conducted network reconnaissance, moved laterally and collected information pertaining to industrial control systems, the systems that run our factories and our grid." So it's not as likely as the lower-level interference that continues from Russia, but it remains part of the suite of weapons that nations could wield against one another in a crisis addition to their traditional military hardware.